Over the last week, I had the opportunity to visit and photograph many of the graves of the Lincoln assassination conspirators. Here are some black and white stills of their final resting places. Location: Old Arsenal Penitentiary, Washington, D.C. Immediately following their execution, the four conspirators were buried in pine boxes next to the gallows. In 1867, their bodies, along with the body of John Wilkes Booth, were reburied in a warehouse on the grounds of the Arsenal. In 1869, President Johnson released the remains to their respective families. 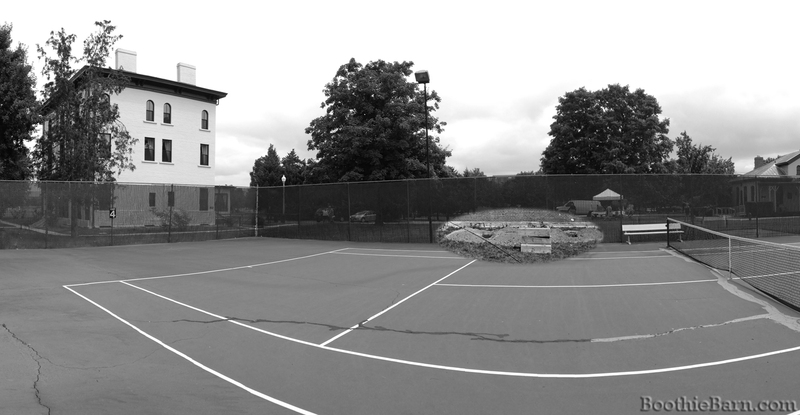 Today, the site of the conspirators’ execution and initial burial location are part of the tennis courts at Fort Lesley McNair in D.C. Location: Green Mount Cemetery, Baltimore, MD. After Booth’s body was returned to Washington and an autopsy was preformed, he was initially buried in a gun box beneath the floor of a storage room at the Arsenal. In 1867, he was moved and his remains were placed with those of the other conspirators in a warehouse on the Arsenal grounds. President Johnson released Booth’s body in 1869. Edwin Booth purchased a family lot at Green Mount Cemetery in Baltimore and had his grandfather, father, three infant siblings, and brother John Wilkes buried together in the plot. John Wilkes Booth is unmarked in the plot. Location: Congressional Cemetery, Washington, D.C. The Herold family had owned a burial plot at Congressional Cemetery since 1834. Davy was the seventh person to be buried there when his body was released in 1869. While Davy is unmarked, his sister Elizabeth Jane was later buried right on top of him. Her stone is the farthest right in the plot. Location: Mount Olivet Cemetery, Washington, D.C. This basic stone bearing only “Mrs. Surratt”, is a replacement for an earlier stone that bore the same text. It is all that marks the plot of Mary Surratt, her children Isaac and Anna, her son-in-law, and some of her grandchildren. Location: Rock Creek Cemetery, Washington, D.C. While Lewis Powell’s skull is buried with his mother in Florida, the rest of his body is likely at D.C.’s Rock Creek Cemetery in a mass unmarked grave in Section K, lot 23. A portion of that section is pictured above. Eerily, one of the headstones in that section is marked “Lewis”. For more about the travels of Lewis Powell’s remains, read the middle section of this post. Last confirmed location: Glenwood Cemetery, Washington, D.C.
Period of interment: 1869 – ? The location of George Atzerodt’s remains are still a bit of a mystery. It is known that they were placed in the public vault of Glenwood Cemetery (pictured above) after being disinterred from the Arsenal. It was erroneous believed that he was then buried in a family plot at St. Paul’s Cemetery in Baltimore. Research facilitated by this website has proven this to be false. It is possible that Atzerodt is buried somewhere at Glenwood but the interment book for that period of time was stolen in the late 1800’s. More research is needed. After Dr. Mudd died in 1883, a tall monument with a stone cross on the top was placed on his grave at St. Mary’s Church. Around 1940, some of Dr. Mudd’s descendants decided to replace the weathered stone. The new stone (pictured above) contained Mrs. Mudd’s birth and death dates as well as the doctor’s. The longest lived of all the conspirators, John Surratt and his family are buried under this plain cross stone bearing only the family name in Baltimore’s New Cathedral Cemetery. Samuel Bland Arnold, one of John Wilkes Booth’s schoolboy friends, was involved in the abduction plot but was not in D.C. when the assassination occurred. Sam was the last member of his family to be buried in the plot upon his death in 1906. Another childhood friend of Booth’s who was involved in the initial abduction plot, Michael O’Laughlen was sentenced to life in prison at Fort Jefferson, Dry Tortugas. He died from yellow fever while in jail despite the attentive care he received from his fellow prisoner, Dr. Mudd. He was initially buried on an island adjacent to Fort Jefferson. After his fellow conspirators had been pardoned, O’Laughlen’s body was transported from Florida to Balitmore. He was interred in the family plot on December 14th, 1870. After his release from Fort Jefferson, Edman Spangler returned to working at John Ford’s different theatres. Eventually he made he way to Charles County Maryland and reunited with Dr. Mudd. Spangler lived on Dr. Mudd’s property doing carpentry work and farming until his death there in 1875. His grave was marked in the 1980’s by the Surratt and Mudd Societies. A bit of a “Where Are They Now” post! I like it.